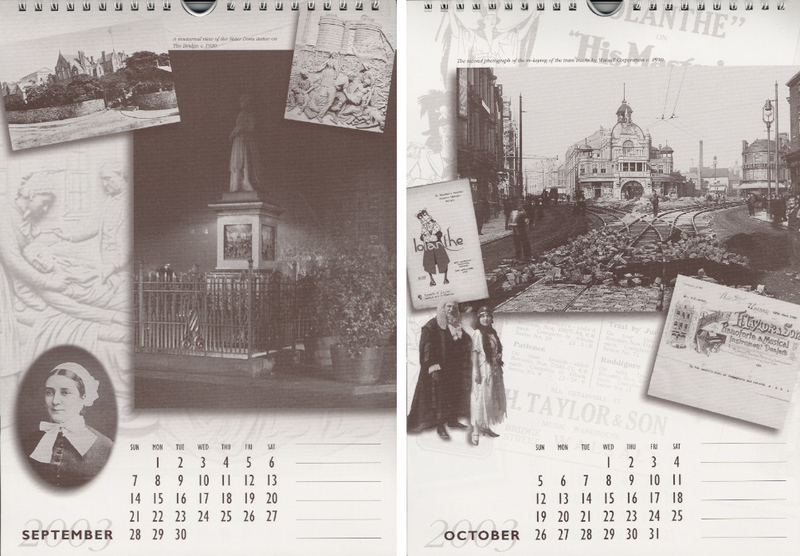 The second edition of Walsall Lives Calendar followed in 2003 in the same format as the first one. 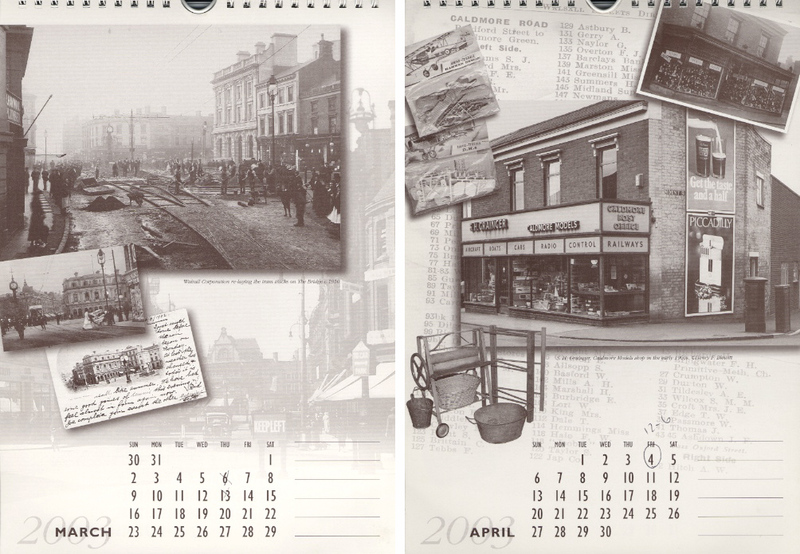 One of the pictures on the front cover is a particular favourite of mine, the one in the top left showing Birmingham Street in the 1920s. Growing up in Sandwell Street this area of Walsall was well-known to me from an early age as it was my mother and grandmother’s route to and from “the town”. As a small boy the well-worn steps that can be seen in always fascinated me, “how old must this street be to have steps that have worn away that much” was the question I asked myself. The buildings on the left side had long gone when I was a boy, I think they may have been demolished in the 1930s when Gorton’s Yard and all of the area around St. Matthews was cleared but the buildings on the right remained until around the early 1960s. Past the building on the right side, where the trees protrude, were a couple of 1930s semis and one of them housed a name well-known to Walsall folk, that of Scoltock. The name around Walsall was synonymous with chimney sweeping from the mid-nineteenth century and quite possibly earlier. 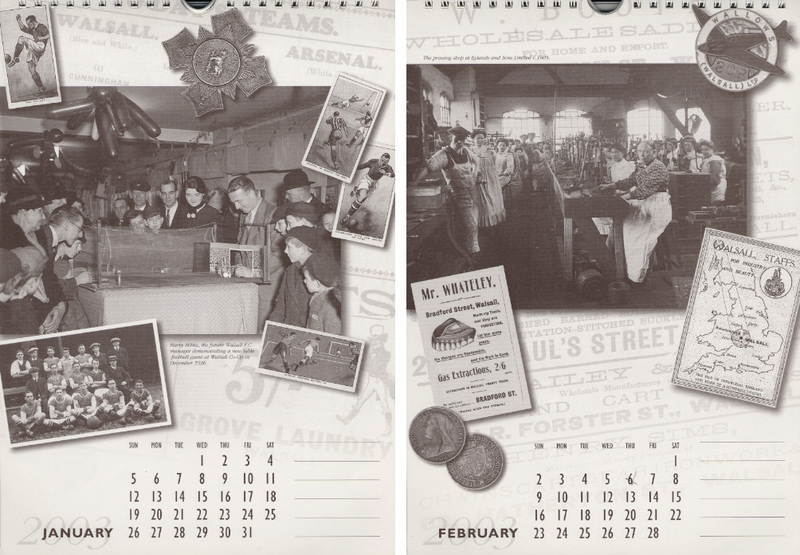 Neighbours of the Scoltocks were the Tonks family, my mother told me that Jack Tonks was a foreman over the seals department (I think) at the Walsall Lithographic…..she should know, apparently he was her boss when she worked there before WW2. Across the bottom of the cover was a picture of Wednesbury Road, Pleck, in 1912 taken from near the junction with Hilary Street. 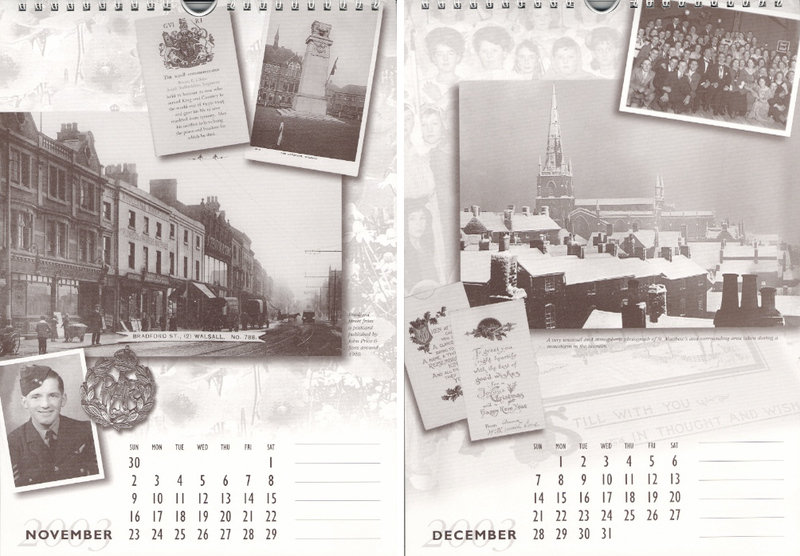 Another great photograph of old Walsall appears as the main picture for December. This photograph was taken during a snowstorm in the 1920s by Blue Coat School headmaster, Frederick Blanchard from a high vantage point somewhere in Birmingham Street and shows the view across Gorton’s Yard to St. Matthews Church. A picture of quality with a real Dickensian atmosphere…….or should that be Nosferatu? The picture is the property Spencer Evans, owner of The Curio Shop in George Street and he allowed me to use this rare and unusual photograph. 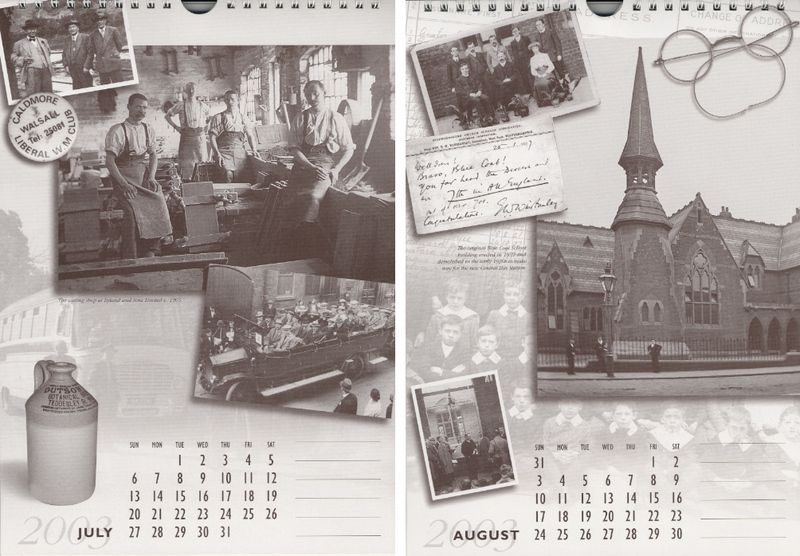 Shown below are the two pages that describes the content of each month’s page throughout the calendar. By clicking on the images they will enlarge sufficiently to be able to read the text easily. 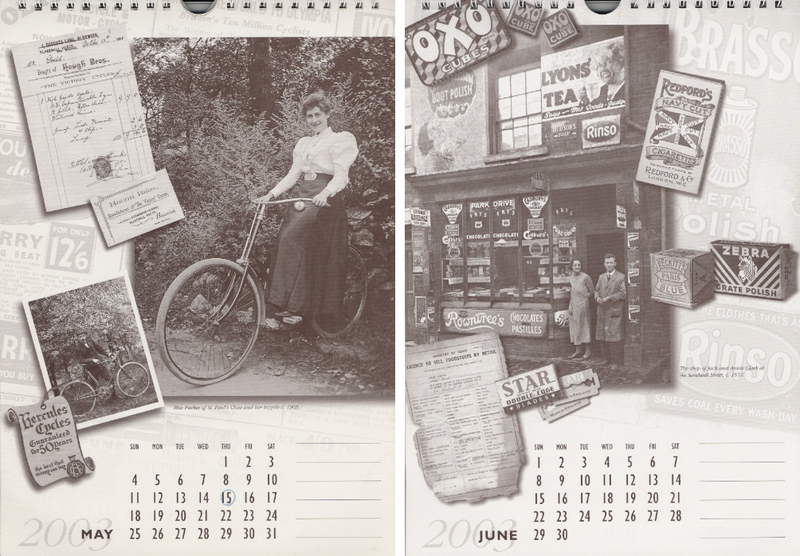 Following these two pages are each months page displayed in pairs. After the success of the first calendar and finding it had been sent abroad as well as all over the UK I decided to add a map of Walsall to show people not familiar with the town where the places were. 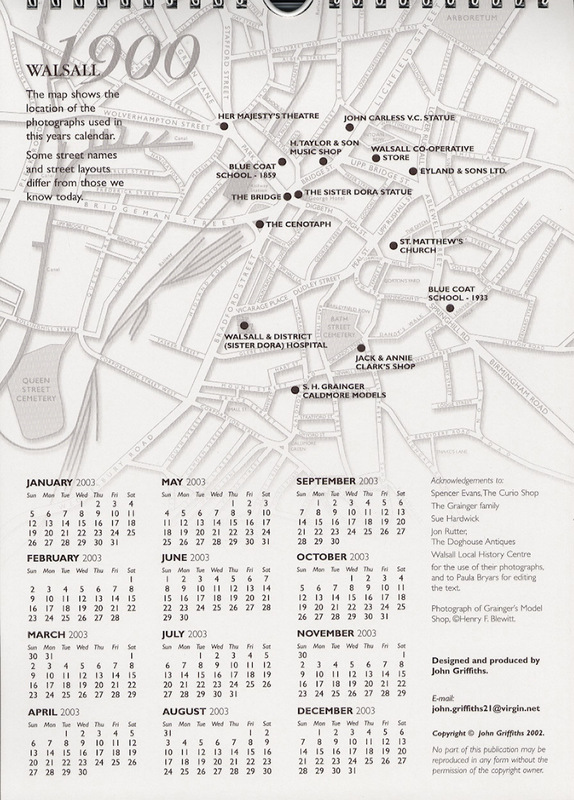 The map was based on a 1900 version and I continued to use it in all subsequent editions of the calendar. 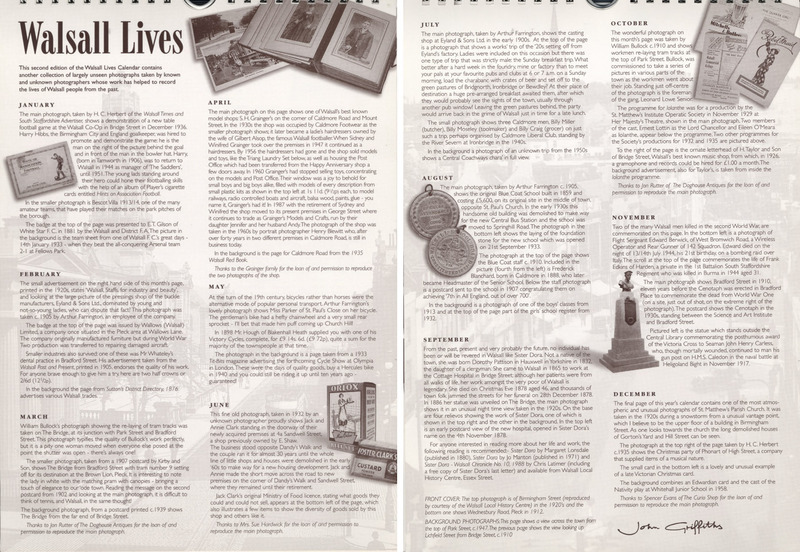 You are currently reading Walsall Lives 2003 at Walsall Life.